« The 2018 Renewal period is now open! 2018 Fall Raffle Saturday September 22nd! 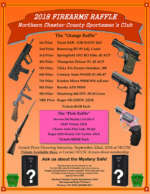 On September 22nd NCCSC members, guests and the public are invited to come on out to the club for a full day of activities, fun shooting events and of course the big Grand Prize drawing for the 10 fantastic firearm prizes. The fun starts at 2:00PM. For more information visit the 2018 Fall Gun Raffle page.